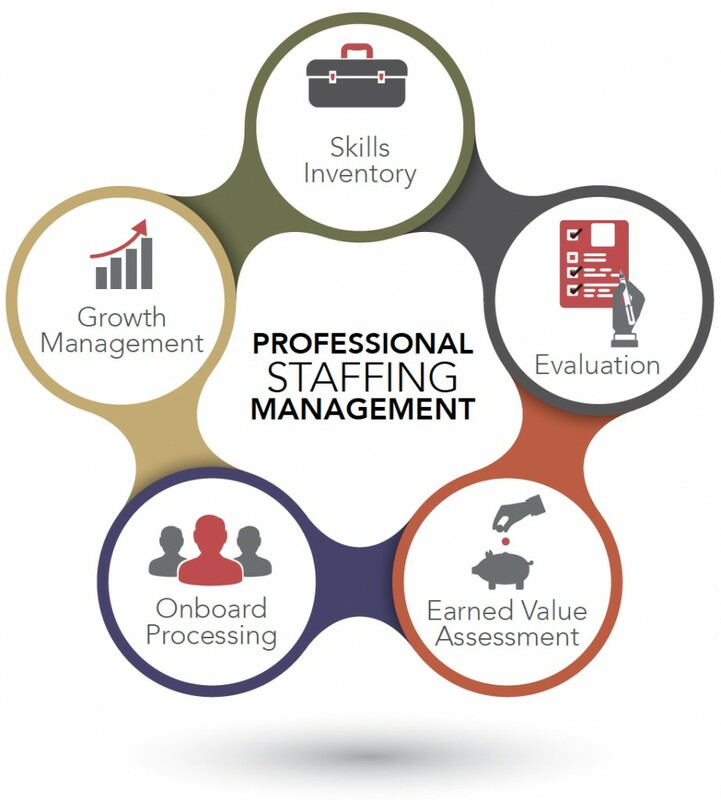 Through Professional Staffing Management, we are able to effectively capture client requirements and attract the strongest talent in the industry. This combination eliminates the “failed hire” concern, allowing client and associate to satisfy or exceed project goals. The result – continuous “Successful Hires”. Our 5 Phase Professional Staffing Management methodology is at the core of The Projex Group’s mission. Our personal service to our client and our associates leads to more successful hires. Our success is based on the satisfaction of both our clients and of our associates. We don’t view our business partnerships as “placing people”. We focus on aligning the personal and professional goals of the associate with the business and financial objectives of the client. Professional Staffing Management is the ONLY means to a positive partnership. Skills Inventory – A needs analysis is conducted with our clients to clearly understand their business, technical and organizational requirements including their corporate culture. During this phase, the customer’s requirements, budgets, processes, and SLAs are reviewed. We conduct an internal and external search for the strongest associates. When assessing new associates to join our team, we perform business and technical knowledge assessments to ensure competency; but we go several steps further and assess the associate’s soft-skills, business acumen and leadership style. Our goal is to acquire and retain high performing associates that transition and contribute in an efficient timeframe. Evaluation– Our highly detailed and personalized screening process starts with a telephone screen. Face to face meetings are conducted as a result of a positive telephone screens. Each associate speaks with a senior member of our management team before being considered for a client interview. This ensures all associates are properly vetted prior to submission. In addition, The Projex Group conducts extensive background review, drug screens, and personal reference checks. Earned Value Assessment– At The Projex Group, we have assembled a team of highly skilled and qualified professionals. Our associates consist of the most highly skilled individuals in their profession – the “Best of the Best”. We have spent decades establishing relationships with TOP business and IT professionals. We continually assess our recruiting and career development models by researching competitive salaries and pay scales, overall benefit offerings, alternative and flex scheduling, and short-term and long-term availability. Through continuous associate pipeline development and market analytics, we are able to identify key qualified associates for presentation. On average, we are able to present an associate for interview within 48 to 72 hours. On-Board Processing – The Projex Group team members are ready to contribute – Day One. We work closely with client administrative and facilities management personnel to proactively manage assets including laptop, network credentials, network access, and that all productivity software is installed and configured. In many instances, we “ramp up” a resource by providing them materials to “self-study” prior to an engagement start, including cultural nuances and or company processes. Growth Management – Once an associate is transitioned, regular communication with the customer and associate is conducted throughout the engagement to meet all needs and requirements. Performance ratings and statistics can be customized to your needs. What makes us unique, being a Certified Training Provider, is that we are able to provide professional development opportunities for our associates. This helps those associates seeking a development opportunity to strengthen their soft-skills, business or IT skills. This results in a win-win for both the customer and associate. We start with a precise understanding of the end results you wish to achieve, ensuring all efforts are focused on meeting your goals. With broad expertise, our team of senior staffing consultants will implement fully customized solutions to help you achieve your staffing objectives.